Nevada Shaped Sweet Tooth Basket by Flag Store of Nevada Inc. at 365 Days Of Kindness. Hurry! Limited time offer. Offer valid only while supplies last. This 16'' Nevada Shaped Gift Basket includes half pound Wood Fire Roasted coffee,Kimmie Candy chocolate Silver Box, a bottle of a Nevada wine, 9 oz. 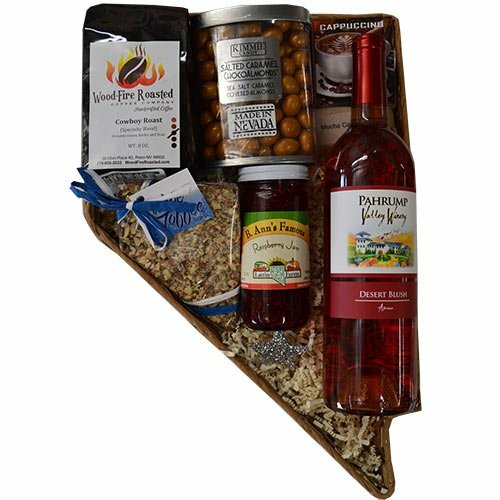 This 16" Nevada Shaped Gift Basket includes half pound Wood Fire Roasted coffee,Kimmie Candy chocolate Silver Box, a bottle of a Nevada wine, 9 oz. Auntie D's Jam, Cappuccino mix, and 4.5 oz Tahoe Toffee NV shaped toffee.